Carving candles is an art form that can take years to master. The carved wax folded and twisted around the core result in eye-catching and breathtaking candle designs. Like any art form, the steps for making carved candles appear simple and straightforward, but implementing them can be extremely challenging. With practice, patience and experience, the techniques used to carve candles will become more familiar. If you can master these techniques, you will be able to make ornate and highly original carved candles. Plan your design. Carving candles requires precision, so it is best to create the entire design before melting the wax. Based on your design, choose a mold for your core candle. Cast your core candle. You can use just about any solid wax, although some will require additives such as Vybar or stearic acid to achieve an acceptable balance of hardness and pliability. Melt the wax to the correct temperature for the mold and type of wax you are using. Blend in the additives and pour the candle. As it cools, remember to fill the well as necessary. When the candle is completely cooled, remove it from the mold. While the core candle is cooling, prepare the dipping vats. You will need one vat for each color you want to include. Melt enough wax in each vat to cover the candle when it is dipped and add the dye gradually to get the color you desire. Maintain the wax at a temperature high enough to keep it melted, but cool enough not to strip the wax from the candle when it it dipped. This will vary depending on the type of wax you use, but will general be around 165-175 degrees Fahrenheit. Dip the cooled core candle into the color, hold it for two to three seconds and remove it. Allow the candle to cool before dipping it into another vat. It's best to cool the candle rapidly by dipping it into a vat of water that is at room temperature. Once the candle is cooled, dip it into another vat. Continue the process until you have the colors and layers you desire. 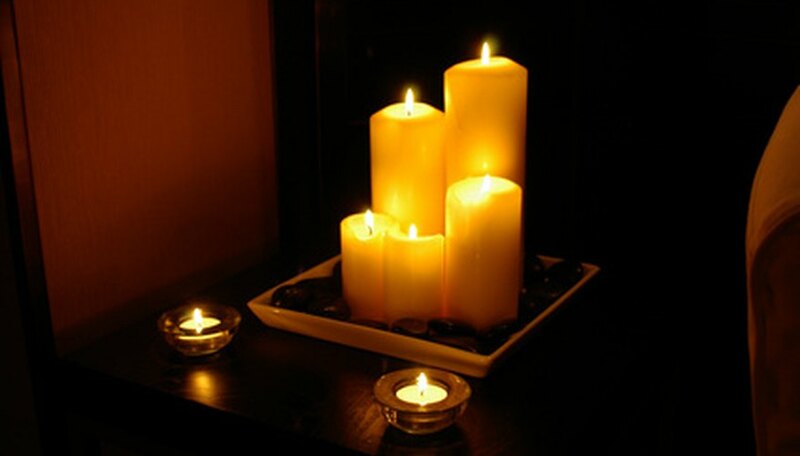 After the last dip-and-cool cycle, trim the excess wax from the bottom of the candle. Using your initial design as a guide, make the necessary cuts into the sides of the candle. Alter the depth and angle to create different effects. Twist and curl the carved "leaves" make different designs. Continue until the candle matches your design. Dip the candle in glaze, which protects the newly carved candle and helps ensure the carved designs remain in place and intact. It also gives the candle a glossy and professional finish. The wax will be hot and can burn your skin. Avoid touching or splashing the wax. Wax is flammable when melted. Avoid working over or near an open flame. Use only sharp carving tools. Dull carving tools are more likely to lead to injury.